Let them know how delighted you are to hear of the safe arrival of a beautiful baby girl. This pretty gift bag is full of stunning fresh flowers in exquisite shades of pink and cream. It's simply perfect – just like she is. 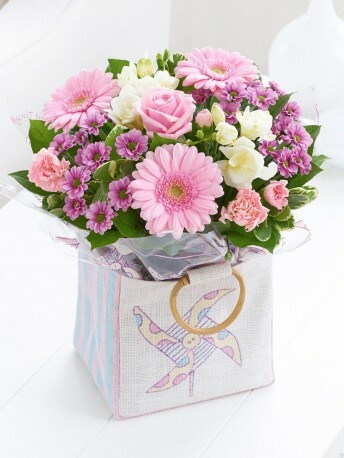 Featuring white freesia, pink germini, a pink large headed rose, pink spray chrysanthemums and a pink spray carnation, with salal and pittosporum, presented in a candy-striped jute bag with windmill motif.